Leo Zamboni was the winner in last year's WesternHunter.com drawing for a guided wild hog hunt with Mark Williams' Guide Service out of King City, California. Here is the report on his hunt. The hunt was fantastic!!! Mark is an excellent guide and he worked very hard for us to get our hogs. This was actually the second trip up to hunt with Mark as the first trip had to be cut short due to unexpected circumstances. We rescheduled the hunt for the last weekend in April 2001. The pigs were all in great shape, fat and extremely good eating. The barley was waist-high on the property we hunted. I hunted with a graduate from my hunter safety classes, which I teach about 6-8 times a year, and another hunter who was from Alaska and happened to be working south of San Francisco. 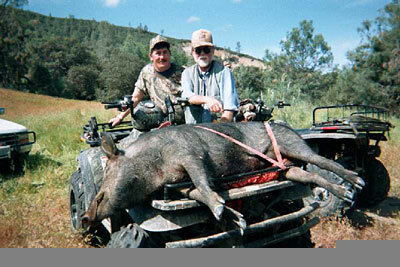 We all scored on some nice hogs  we estimated their weights from 150 to 300 pounds. 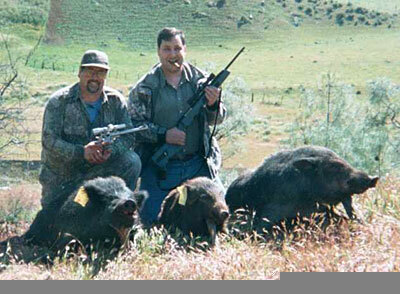 Leo (left) and friend John with their hogs. I took my pig with an Ace Hindeman Customized Ruger Super Redhawk, using a handload consisting of a Sierra 300-grain JSP in front of a very generous amount of Hercules 2400 powder. I've chronographed this load at 1250 fps out of my 9-1/2" barrel and it will group under 1-1/2" at 100 yards off of sandbags when I do my part. I shot my pig at 80 yards as it was moving away from me up a ravine. The others pulled off some spectacular shots  one of which was 411 yards on a dead run!! We checked these numbers with a Bushnell Laser RangeFinder. Mark Williams, our guide (front), shows off a nice slab of bacon. I can honestly say you will not be disappointed if you book a hunt with Mark Williams. He knows his stuff and will do everything possible to help you get pigs. Thanks for making this hunt possible!! !